Komamura：Congratulations Professor Yasui on having become the new director from October, 2018. I was one of the founding members of KGRI and served as its first director for two years from 2016. For the readers benefit too, I shall give a brief outline of my career to date. After studying at both the Department of Law, Faculty of Law and the Graduate School of Law at Keio University, I am currently teaching the "constitution" at the Faculty of Law and Law School. I returned to Keio in 2003, after which I studied abroad in America for about 2 years. I was subsequently appointed as the principal of Keio Senior High School and from around this time I became interested in education across the whole of the Keio beyond the limited scope of the undergraduate faculties, including at the affiliated schools. After serving as the principal of the high school, I was appointed as a vice president. I was put in charge of areas including general affairs, legal affairs, public relations, alumni affairs, and student life services, and did work that supported research and education activities at Keio from behind the scenes. From the year before last, I became the director of KGRI, this time to support "research," or more specifically, forefront interdisciplinary research. For someone who studied jurisprudence, an area that is a typical example of an inward-looking discipline, I have been having a revelatory experience. I think I should probably hand the baton over now. Professor Yasui, could you please introduce yourself. Yasui：I am Masato Yasui from the School of Medicine, and in October this year, I was appointed as your successor as the second director of KGRI. I am a professor at the Department of Pharmacology, School of Medicine, and affiliated with basic research in medicine. I was originally a pediatrician, and I still continue to do a little work in this capacity. To briefly tell you about my career history, after graduating from the Keio University School of Medicine, I did a medical internship at St. Luke's International Hospital and was an assistant at the Maternal & Perinatal Center, Tokyo Women's Medical University, before going on to study abroad at the Karolinska Institutet in Sweden. After finishing my doctorate at Karolinska, I did research for 8 years at Johns Hopkins University School of Medicine in the US, and returned to Keio in 2006. Originally, I had only planned to study abroad for a year, but I experienced firsthand the prestige of European universities and was overwhelmed by the depth of learning and weight of education, and before I knew it, I had spent 13 years overseas. Drawing on my experience of education and research in Europe and the US, I have made efforts to promote international exchange at the School of Medicine such as providing as many opportunities as possible for young students to go abroad. However, I haven't really had many opportunities to be directly involved in international collaboration and research at Keio University as a whole. I feel that being appointed as the director of KGRI, which aims to increase the research ability of the whole university and its international competitiveness, will be really rewarding. Professor Komamura, you said you were the instigator of KGRI. Please tell me the background and details of how KGRI came to be established. Komamura：It is better to say that I was one the instigators. 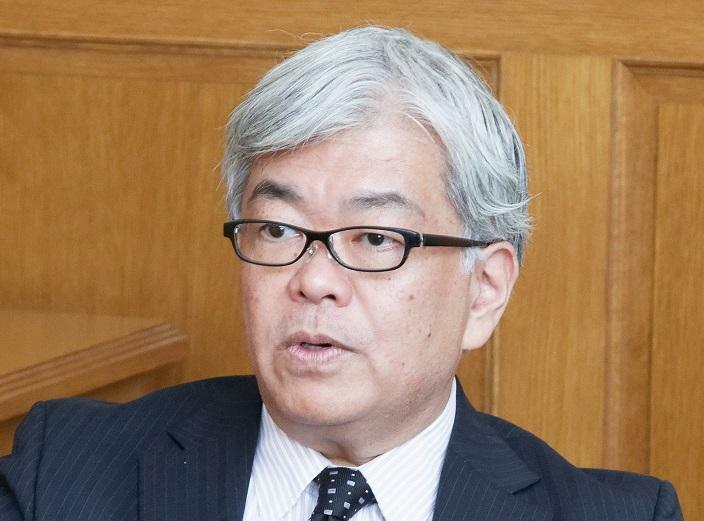 The Top Global University Project (SG) began when Professor Atsushi Seike was president, and even before that, President Seike had declared that Keio would strive to be an international research university. It was decided to divide the research unfolding at the university under the three initiatives of "longevity," "security," and "creativity," and to develop a research front with these as a single conceptual driving force. During this process, every time I met with Vice President Jiro Kokuryo who was in charge of SG, we would talk about how it is a waste to simply organize the various research projects conducted at each campus conceptually, and that it is also necessary to have a base that puts the research outcomes into a single showcase to publicize externally. At that time, I had just taken over as the director of G-SEC (Global Security Research Institute) from Professor Heizo Takenaka in addition to being a vice president. An idea that merely began with the chats I had with Vice President Kokuryo led to more formal discussions on developmentally reorganizing G-SEC and tying it in with SG at the board meeting, and as a result of this, KGRI was born. Yasui：As former President Seike had thought, it is very valuable to have a base to promote research not only for researchers but also for students. I also think that the three themes of "longevity," "security," and "creativity," are research subjects that are of paramount importance for solving the issues currently borne by the human race. Komamura： KGRI has several missions but they can be divided broadly into three parts. The first is to establish research projects in each of the three initiatives I mentioned earlier, and based on these, assemble numerous researchers from inside and outside Keio, have them undertake diverse activities unfettered, and circulate the results both domestically and internationally. The second is to develop new academic fields that aim to be interdisciplinary and transdisciplinary. Integration of the sciences with the humanities and social sciences is representative of this. Integration does not mean just academic integration. We want to go beyond the faculties and even campuses, and create a place where Keio researchers can gather. We also want to provide a place where potential researchers of the future inspired by this will converge. The third is to publicize our research outcomes to the world in English. The three initiatives I mentioned earlier are not simply conceptual groups but a framework to "visualize" new research horizons. At KGRI, for research projects carrying out promising research, we have been carrying out a scheme called "caravan" that provides financial support for flights and accommodation to a large number of researchers every year under the condition that they announce their outcomes in some form in English, such as presenting their results overseas, or to hold events overseas to build new international collaborations. After its establishment and during the 2 years of my tenure, I think that I was able to get the basic platform that was in the initial plan operational. Of the operating expenses, about 100 million yen is used for research grants, divided over a period of 3 years, on promising projects. The dynamism of the initiative, which requires them to become independent at the end of 3 years, has completed a whole cycle in March this year. The second round began in April, and while in the first round there were many loosely tied projects covering a wide range of topics, in the second round, adjustments were made and each initiative will now somewhat concentrate on and invest resources in a highly recommended "Core Project." It can be said that KGRI is also open to making successive changes to the original plan. Another big development is that KGRI can now have its own institutes, which is highly significant. Dr. David Farber, a leader in programming and cybersecurity, was welcomed as a Distinguished Professor under the new personnel system called "senior non-tenured." Furthermore, we have hired multiple top level young overseas researchers as Project Assistant Professors who generate research outcomes in the form of papers. What is born from the synergy between the older and younger generations will be a major strength of KGRI. We also established the "Cyber Civilization Research Center (CCRC)" as one area to integrate the three initiatives. Welcoming Professor Farber, the professor I just mentioned, and Professor Jun Murai of SFC as codirectors of the center, its research not only deliberates the practical use of cybertechnology but also reconsiders this from the viewpoint of the history of civilization. We will have discussions at the level of examining the possibility of fundamentally changing the market and reexamining the whole concept of what it is to be human. I am looking forward to seeing what kinds of outputs will transpire hereafter. Yasui：I was involved with KGRI from the time of its inception as a deputy director, and I feel that we took a revolutionary first step to promote interdisciplinary research in the last 2 years. In fact, we are seeing more international researchers, while the tangible results of several interdisciplinary research projects are finally beginning to show. I have the impression that we definitely have the foundation to produce many more results from here onward. Komamura： It's a little different from research outcomes, but one of the good things about establishing KGRI is the appearance of a "topos" to talk about the future of research and a space that is shared by Keio faculty beyond their campus and beyond the distinction between the arts and sciences. I think that this itself is a big breakthrough. At KGRI, we regularly hold a "researcher networking event" where we have the opportunity to have a drink and talk. At these events, we might find a peer in an unlikely place, or talk about a company or researcher we know in common. Despite being members of the same university, people who had no point of contact get to know each other and can now enjoy encountering the unknown that is born from this (laughter). I doubt that there are other events that can shake up our intellectual curiosity to this extent. It makes me aware again of the diversity and depth of the people here at Keio. Komamura：We publicized the presence of KGRI in Japan and abroad as well as within the whole of Keio University, but I regret that it hasn't always been enough. Professor Yasui, I would like to see greater publicizing, an increase in the quality of interdisciplinary research, and active development of the next generation under your new management. Professor Yasui, what do you think about this? Yasui：To talk about KGRI's research again, I want to commit to developing academic subjects that have been subdivided up to now, while once again promoting awareness of the relationships that they have with one another. I think that academic subjects in the 20th century were subdivided and developed in great depth. As a result, many outcomes were achieved. On the other hand, these subjects became more specialized and we began to see people no longer being able to understand other disciplines. To break through this situation, which cannot be overcome with those who have the same outlook, it is essential to interact with researchers who have different points of view. For this, I think that we first need to provide a "place" in which the "dynamism of relationships" can be fully utilized for the whole university, as well as domestically and overseas. Komamura：Professor Yasui, I would like for this "place" that you propose to offer not only to be seen by researchers, but by graduate and undergraduate students and even junior high and senior high school students at our affiliated schools. In a way, and I am just as guilty of this as anyone else, faculty members are very conservative and are likely to be easily swayed to shut themselves away inside their own discipline. At the same time, however, they have a sense of crisis of having to integrate the arts and sciences and to do interdisciplinary research. To overcome this mindset, I think that it is important to get the next generation of youths to actually experience the need for interdisciplinary research to take a form different to that of the academic categories which have been used in the past. This itself will open up new fields of research 10 or 20 years down the line, and of course ties into the development of the researchers who will be engaged in these fields. Yasui：Yes, I want to actively create opportunities not only for graduate students but also for undergraduate students in the general education courses and junior high and high school students to participate. I very much want them to accumulate experiences and grow further by breaking through their shells and expanding their horizons. KGRI must continue to develop as a place that can provide this kind of environment. For this, I think that getting financing or fundraising will also become an important issue from now on. Professor Komamura, what do you think? Komamura：Fundraising is also an extremely important issue. How should you get research grants for the research you are carrying out? How should you organize the people who will support you? Basically, this is the job of the University Corporation and those in charge of departments such as deans, but I'd like to see each researcher also taking an interest in this. I may be going too far by saying we should commercialize research, but I think management skills will be required in the future. Yasui：I agree with you, and particularly when researchers from different fields come together to develop a big project, I think that there will be more demand for management skills. I understand that the mission I have been assigned is to ensure that KGRI is aware of these things and yet continues to take up good research while demonstrating skillful management, as well as developing into an appealing place in which faculty members want to participate upon finding out such a research base exists. At first, I think we need to produce examples of success, even if these are only small, and through fully circulating these cause something like the phenomenon of sympathetic resonance. What is required in the next phase is something that causes bigger waves to solve problems. Yasui：Finally, I want to talk freely about future tasks and challenges with you Professor Komamura. 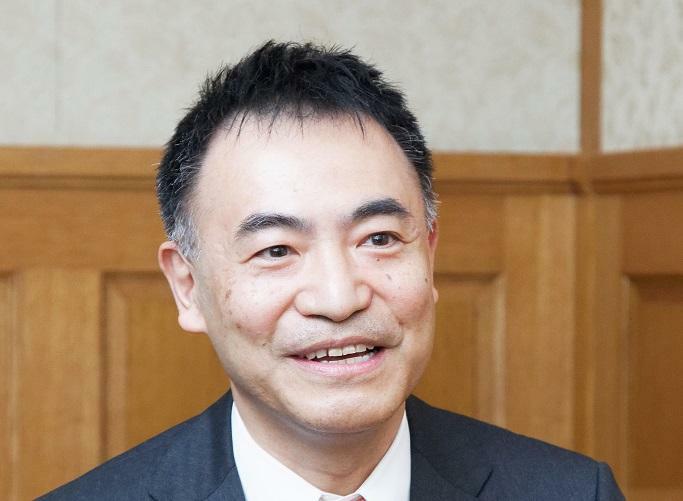 Komamura：I think the biggest task is to create unification within the university. It can't be said that KGRI activities themselves are widespread within the university. In our current state, we can't say that we are a source of influence that can muster momentum for research. One reason for this is because the research period of the initiatives is set to end after 3 years. This is good from the view of distributing resources, but this also means that the resources KGRI can provide at the university becomes fixed during the 3 years and there is a possibility that unification will not materialize. How can this be improved? I think one way to do this is to focus on developing research which is expected to see strong growth like CCRC (Cyber Civilization Research Center) or can answer societal needs and expectations. To develop it as a single large research block, I think you will need to get the cooperation of each initiative leader to develop something that will be the core of the individual projects and move the 3-year research projects forward. In this sense, I think one activity of KGRI that will be important will be for it to be positioned as a training institution to create institutes within KGRI. When such a core research base emerges, it should increasingly focus and invest in caravan resources, resources to hire assistant professors, and the like. I think this is one possible way to use the 3-year funded period. If KGRI can take such a position and push research forward, I think that we will also start to hear people on campus expressing an interest to give it a go. Yasui：Professor Komamura, like you say, KGRI is still in a transitional period or at a midway point, and to be honest, it can't be said that the level of awareness within Keio is high. I think that in order to strengthen unification, we need to use opportunities such as faculty meetings or seminars held on campus to go and carry out PR activities informing people about what we are doing. At the same time, we need to do global PR activities. Recently, as part of KGRI's caravan activities, I visited the University of Cologne in Germany and a research center in Grenoble, France with professors from the Faculty of Economics, Faculty of Science and Technology, and School of Medicine. As a result, an integrated arts and science graduate school distance lecture series (12 classes) jointly operated by the University of Cologne and Keio began immediately from this fall.This was also the first attempt at Keio for several graduate schools to come together and collaborate with an overseas university on lectures for a course with credit, but it was very popular with the students and I hope that we will be able to keep this going in the future. In addition, centering on medical and industrial collaboration, a research project that expects a joint patent application with the research center in Grenoble has also begun.Furthermore, initiatives to jointly launch ventures are gradually starting to progress. By going abroad with professors from multiple faculties and graduate schools like this, global interdisciplinary research is spreading rapidly. Frankly, I think that this is Keio's strength as a comprehensive university. Ideally, I think we need to get to a point where there are strong sideward connections or almost no gaps between the Keio faculties through the active sharing of information or exchange of opinions. I expect that as the outcomes of these efforts gradually increase, and if specific images of success can be shared, the unification efforts by KGRI will also grow right away. Komamura：I think that in a way, the faculty members carry with them a sign such as Mita, Hiyoshi, Shinanomachi, Yagami, SFC, Shiba, and City Campus, or that there is a competitive spirit of wanting to make their resources look good. This is great, and from this, I am also hoping that in the future, they can realize how things can become more interesting by combining what each has to offer, like a chemical reaction. In November, there was an inauguration ceremony for the new president of Harvard University and I attended as the representative of our president. Prior to the celebrations, I attended an event at a theater on campus where a representative faculty member from each of the 10 Harvard graduate schools presented the forefront of their research in 10 minutes. As expected, it was stimulating and they succeeded in making their research projects look attractive, and to be frank, they were being commercialized (laughter). Looking back, if you have seen the last few researcher networking events of KGRI, especially the presentations and the kickoff we had for CCRC at the recent event held at Shinanomachi, I do not feel that we are losing at all (laughter). I want them to realize the potential of feeling that they are doing well again, and I hope that you will work hard to lead KGRI from now with an enthusiasm of making "by Keio" a benchmark, Professor Yasui. Of course, I will continue to commit as a member of the Steering Committee. Yasui：Thank you. It is very encouraging for me to have you behind me. I will do my best to push not only the development of KGRI but also the strengthening of Keio's research capabilities.